A wide variety of cold-headed components make up the products we supply as cost-effective solutions to our customers needs. 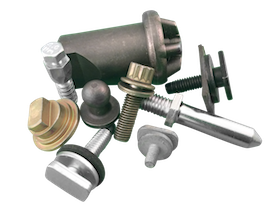 If its standard or metric, material waste is eliminated, since cold formed fasteners are upset, extruded, or impacted. Greater strength, reliability, and durability result from replacing your multi-pieced assembly with ONE cold formed part. Your productivity is increased by minimizing product assembly time. If you have not downloaded our brochure, please do so now by clicking here. We sincerely hope this will help you visualize the possibilities we can explore together.